World Patent Information aims to encompass the world of IP information; and focus the journal towards IPRs for industrially applicable innovations; and their management, analysis; big data analysis; policy; education. IPRs - patents, utility models; copyright, trademarks, registered design; design rights; trade secrets; database rights; traditional knowledge; indigenous knowledge; geographical indications may all be considered. 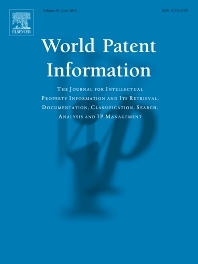 World Patent Information publishes articles regarding best practice in legal and commercial patent search and analysis; articles which focus on particular types of search such as freedom to operate, FTO, clearance, state of the art, invalidity, validity, prior art, technical, landscaping, scouting, forecasting, patentability, decision searching, competitive intelligence using patent information. We are also interested in articles researching into meta data relating to IPRs such as legal status data for IPR; classifications and bibliographic data. We are interested in IP documentation, search, documentation, classification and IP information news from IP Offices. Always welcome are reviews of state of the art in a particular industry, reviews of patent, and other IP and scientific and technical databases, search and analysis for IP purposes. Research and review articles on information related to non- patent IPRs , trademarks, trade names, brands, designs, copyright, trade secrets, traditional knowledge, semiconductor rights, database rights, where these have impact for the technological innovation space. Best practice search and review articles, on sources of data. IP management information issues, inventions harvesting, IP services and intermediates and use of text mining and data mining for IP interests. Information retrieval (IR) relating to all aspects of IP published information not only text but also document specific, e.g. bibliographic, name, geographic; multi-lingual search, image search, tables, other non-text; text mining, Natural Language Processing (NLP); Information Extraction from patents e.g. – mathematical formulae, chemical, biological, plant, related data; Machine Translation, Machine learning, automated intelligence focused towards improving IP search and analysis; System Evaluation and Benchmarking, Data collections for IR experiments; Best practice for IP; IP management of Patents, Trademarks,. designs, know-how, copyright, trade secrets; organization of IP tasks in companies and research institutions; Innovation management -impact of patent and IP management; information management for IP best practice, TRIZ and its implementation for innovation processes; Technology management –characteristics and dynamics of technologies in IP perspective, IP portfolio benchmarking, valuation, geographic, expiries, technological, Advanced analysis –market, corporate, policy level, statistical analysis, Business methods patenting, Standards - standard essential patents – patent pools.